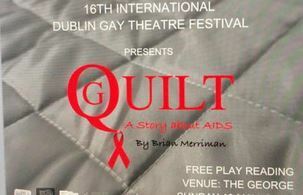 Quilt (with a G embedded in the Q) is a new play about AIDS. An older Man and Woman and a young Man and Woman tell the story of a “plague” that devastated the gay community at home and internationally when it emerged in the 1980s. Using many testimonies from lovers, volunteers, activists, sons, daughters, husbands, wives and parents, Quilt tells a story that knew no discrimination from celebrity to the marginalized. With HIV rates rising again, the stories of Rock Hudson, Vincent Hanley and tens of thousands of others will move you to action. Quilt is a profound story of eternal love and survival.